A native of Waunakee, Wisconsin, McKenna won the title of Miss Wisconsin 2017 as Miss Madison-Capital City 2017. This was McKenna’s first time competing at the state pageant and was the recipient of a preliminary talent award for her ballet en pointe to Swan Lake. She’s a student at the University of Wisconsin-Madison where she is pursuing degrees in Communications and Political Science. She plans to also pursue a jurisdoctorate Degree. 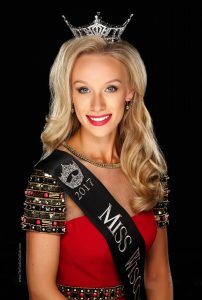 During her year as Miss Wisconsin, McKenna will travel throughout the state, logging thousands of miles promoting her platform, “Table Talk: Promoting Civil Discourse.” Table Talk focuses on bringing civility back into conversation in Government, Educational Settings and Daily Life. She highlights the importance of finding common ground, becoming thoughtful listeners and working to understand and appreciate what what makes us unique. At 16, McKenna founded her own small business, MyBella Birthday. She served as a Congressional Intern for U.S. House Speaker, Paul Ryan and Wisconsin Speaker of the Assembly, Robin Vos. She also danced professionally for Madison Ballet as a contracted ballerina for three years. McKenna is an avid windsurfer and considers herself a hot yoga junkie.